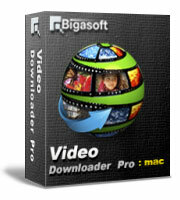 Moreover, it can also act as Mac video audio converter. The powerful Mac video to audio decoder helps easily extract audio from video files like MP4, MOV, AVI, MPEG, MPG, 3GP, DivX, Xvid, ASF, VOB, MKV, WMV, H.264, 3G2, FLV, MOD, TOD, MTS, WTV, WebM, etc. and then convert to any audio format as you will, such as convert YouTube to MP3, convert MOV to MP3, and more. 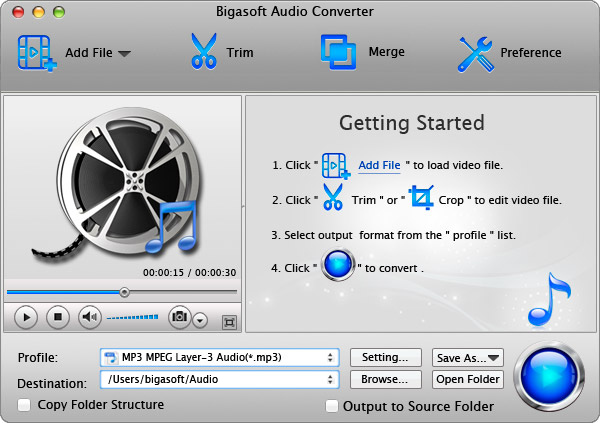 Free download Bigasoft Audio Converter for Mac and start unlimited enjoyment right now. 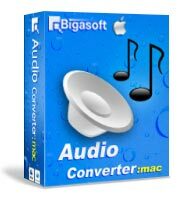 Ready to try or buy Bigasoft Audio Converter for Mac? The nice Mac music converter allows you to split music file into several smaller audio files by setting start time and end time or split audio files seamlessly based on chapter markers or based on .cue files. In the task lists, simply click "Split by Chapter" in the context menu, your files will be splitted automatically. Simply drag and drop, you can easily complete your conversion as easy as 1-2-3. It's that easy. The professional Mac Audio Converter is compatible with Mac OS X v10.4 (Tiger), 10.5(Leopard), 10.6(Snow Leopard), 10.7(Lion), 10.8(Mountain Lion), 10.9(Mavericks) and 10.10(Yosemite). Fully supported Mac OS X 10.10. Fix issue in converting TIVO files to audio formats. Add support video/audio download from new YouTube VEVO channel.